So I really like how my Sentry R3 design turned out and decided that I want a platform for FPV and hopefully to eventually carry the APM 2.5 and camera for small area mapping. In any case, I put together what I call the Sentry Heavy. -1m wingspan + a .13m fuselage. So 1.3m wingspan? This is just the prototype so I didn't bother sinking in the servos or any further finishing. Just complete enough to fly. 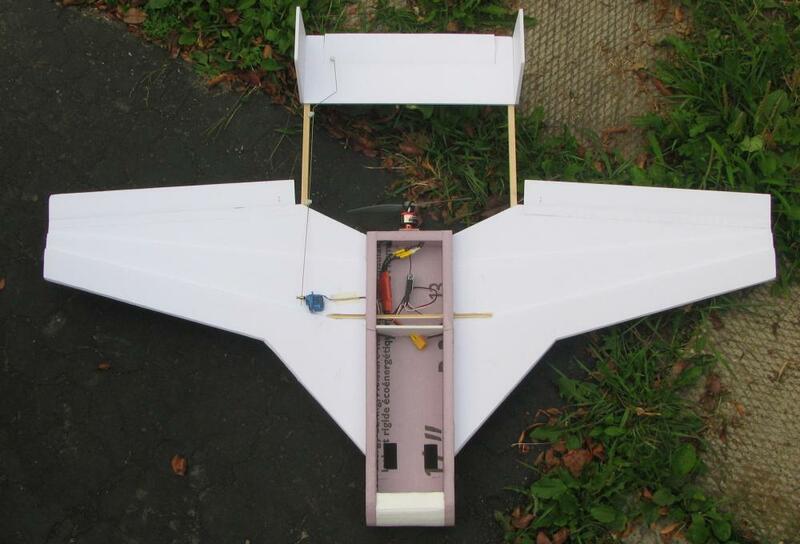 -Can I improve roll stability by adding angled wingtips? Will they add a bit of dihedral? -Suggestions to improve efficiency so that I get longer flight times? Currently runs about 15 min at 1/2 throttle with batteries drained to 11.2V. Different prop or motor. I think it's a great looking plane and looks to be a fairly quick FPV airframe that still slows down nicely! Angled wingtips probably would make it more stable but would also make it more susceptible to crosswind or gusts. Keep that in mind and don't go too large with them. The angled tips would, in effect, make it a polyhedral and it would fly a little more like a nut ball or old fogey. Maybe a little wing rock but more self righting. You have a decent wingspan, I think it would be a good idea to give it a try. Improving efficiency could be done by making all leading edges more streamlined to reduce drag and most definitely a cover for the open bay. One thing that might or might not help; if you were to extend an inch or 2 and taper the rear of the pod to where the motor mounts, it might give you more undisturbed (well, less disturbed, anyway) airflow to the prop and probably less drag as well. I like it as is, but you did ask the questions! Hope some of these help. Let us know. digging the huge fuselage area, lots of battery. Maybe some LRS FPV in future would be cool to see. I built my twin boom similar to yours for that reason. Very cool build man. I will try some small angled wingtips and see how they perform. If good I'll post the picture, if not, I'll just take them off. I did give the leading edge a quick radius, but still have to do the tail. (still contemplating the size/shape) And I also tapered the fuselage towards the motor. Just checked hobbyking and a single 3000mAh would give more amps for the weight than my 2 1300s. You win! haha. Thanks a lot! And yea I decided that a big fuselage area would be beneficial in the long run as the need arises. LRS has been on my mind but I think I'm a bit too early for that, but hopefully eventually. The current priority is short range FPV and aerial photography with CHDK. I seemed to have worked through the problems with my OSD after installing CL-OSD. FPV gear is mounted inside so hopefully I can get a day flying on the weekend. I'll upload the vids as well. Also will be trying out some wingtips. So I had quite an eventful weekend, unfortunately I misplaced my camera charger so I didn't get any video I think I know where it is now, so hopefully this week I can upload stuff. 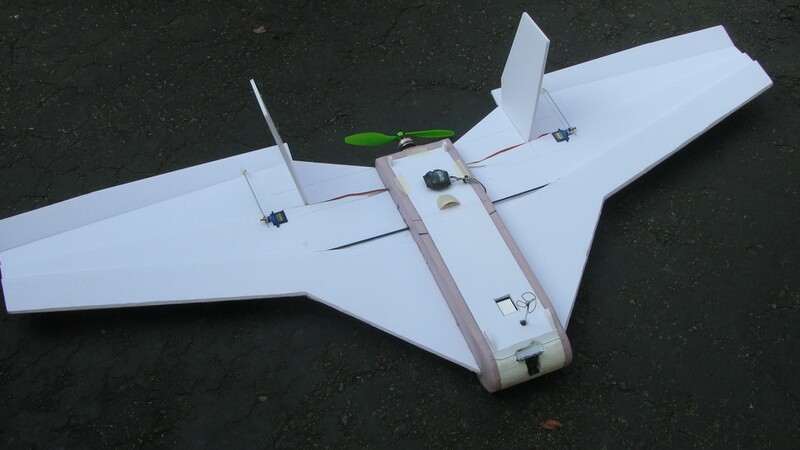 I tested out the 1st design seen in the pictures above with FPV gear. FPV was really fun! but also really confusing, luckily I had a good spotter and new the terrain very well. With that above setup I was able to fly around for about 15min before the batteries drained down to 11.1V (or ~10.7 under load as seen from the OSD) However, I noticed that full throttle now needed to be applied on take off and to climb to an appropriate height. Once up it needed about 3/4 throttle to cruise (as opposed to 1/2 before fpv gear). So I decided that I need to shave some weight. Tail booms came off as I had a feeling it would be stable enough without it. Sure enough it was! So the new design is just a regular flying wing. I then tried to simulate the extra weight of a digital camera. The plane struggled again to get altitude at full throttle. The next step was to rebuild the wings 20% bigger. And I think I finally have a winner! It flies so nice and can take the extra weight. Once I get the CG perfect it will fly even better. Glides really nice too. An unfortunate mishap on the last flight though. I guess that hot glue doesn't adhere well to bare pink foam as I made a tight turn and the glue holding the wing on the fuselage broke. Luckily the top carbon spar held the wings on but it looked like a bird flapping its wings coming to land. Haha it was quite funny to see wish I had it on video. Even still with the wings compromised I was able to land without damage. Now that I've settled on a design that is larger, what is the best way to make sure the wings don't come loose like that? Is there a better medium to make the fuselage out of? Foamboard, balsa? 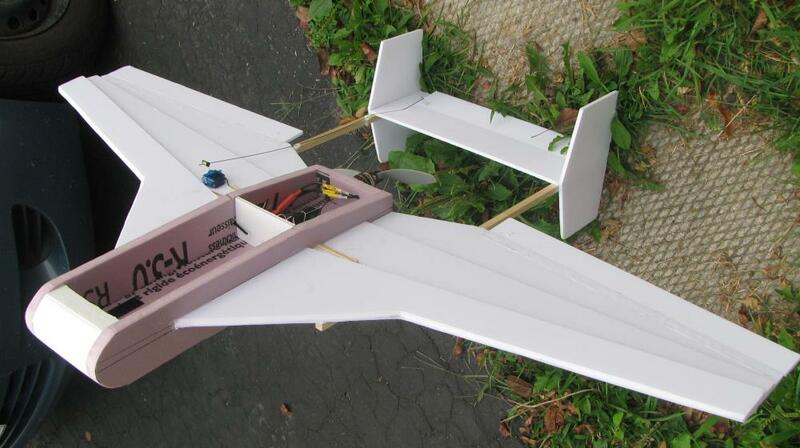 I will also add another spar on the underside of the wing that goes through the fuselage to mirror the top. I'll post pics tonight. Nice work mate. If you ever have to rebuild the fuselage, try tapering it down at the back, this way it'll be a lifting body fuselage and will help you gain more lift. I like the look of your plane mate. Keep the updates coming. Thanks a lot! I will definitely keep that in mind if I have to rebuild again.